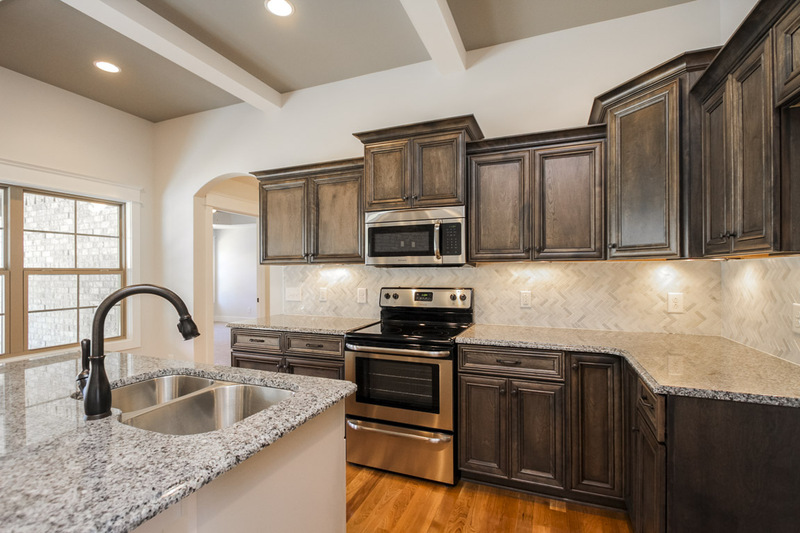 Tate Granite | Tate Ornamental, Inc.
Tate Granite, a division of Tate Ornamental, Inc. is to committed to unparalleled service and exceptional quality in Residential Stonework. We offer the highest quality of workmanship and stone while keeping our products affordable. 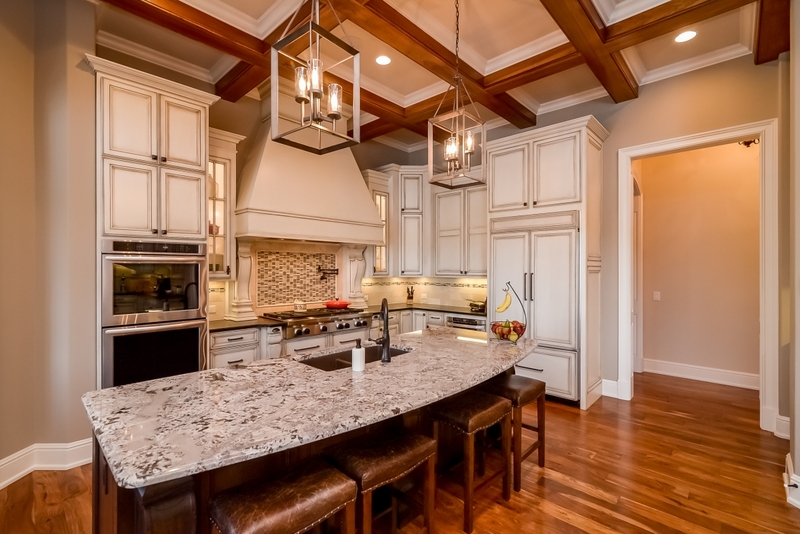 Countertops add value, design, and function to every home. 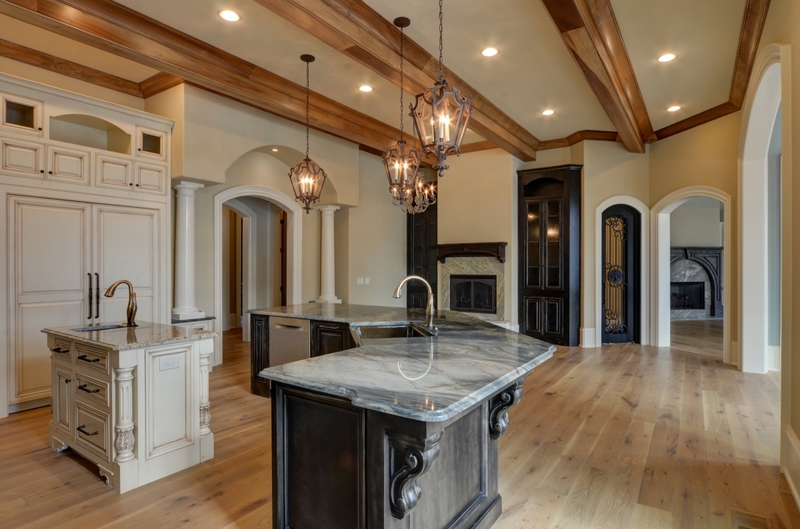 Our team of stone artisans and technicians have over forty years of experience in the art of detailed fabrication and precise installation of granite, quartz, quartzite, & marble. 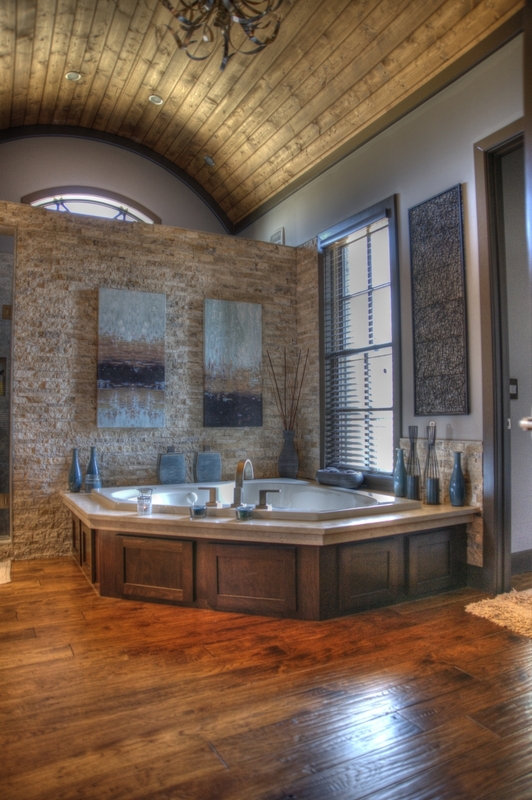 Our stone experts will help match your space, taste and budget. To ensure your stone or surface is cut to match your counters, we use a 3D Prodem Proliner for digital templating and a Park Fusion high pressure waterjet saw to cut your countertops accurately to a sixteenth on an inch. We use Slab Smith Perfect match software on every project for the best result possible. We offer a ten year warranty, as well as a complete satisfaction guarantee on our products and installation. Our experienced installer’s ensure that the stone selected for your project looks as perfect installed, as in our showroom by being precise. Our craftsmanship is reflected within the beautiful results. There are many different and unique types of stone. 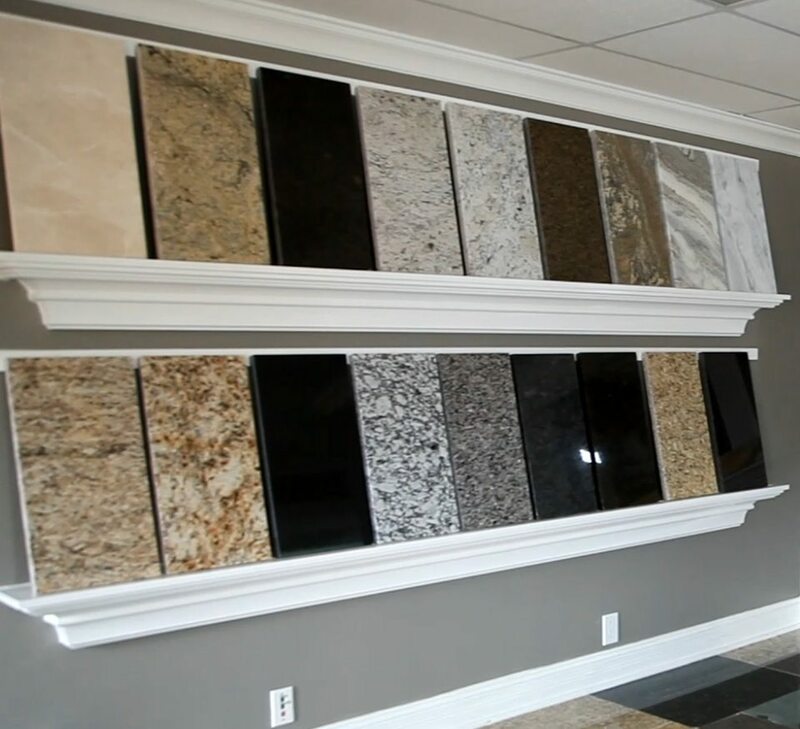 Tate Granite will educate you on the different colors and patterns for each stone and help you make the selection that will compliment your style. 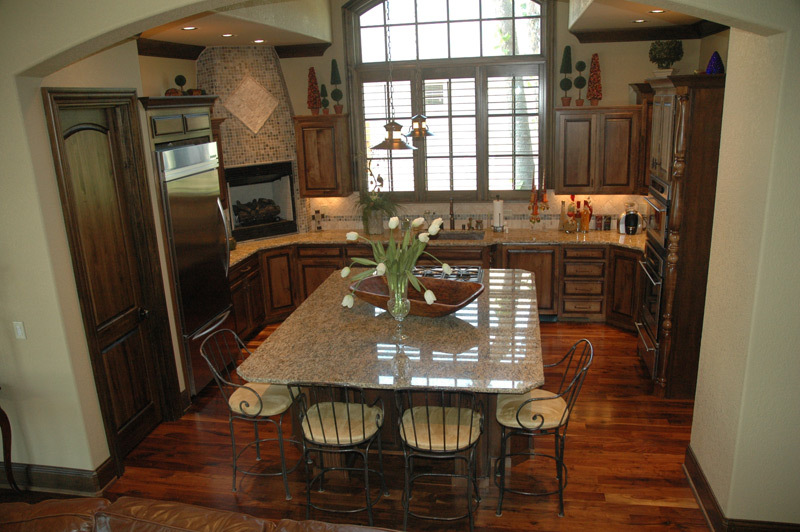 By far the best choice and the most popular stone featured in homes today is Granite. It is known as the hardest structural stone and is well suited for high-traffic areas such as kitchen countertops, bathroom vanity tops, backsplashes, flooring, fireplaces, stair treads and much more, making its beauty and elegance last more than a lifetime. Since granite is a naturally occurring stone, color pattern, texture, and crystal size will vary, meaning no two slabs are exactly the same. 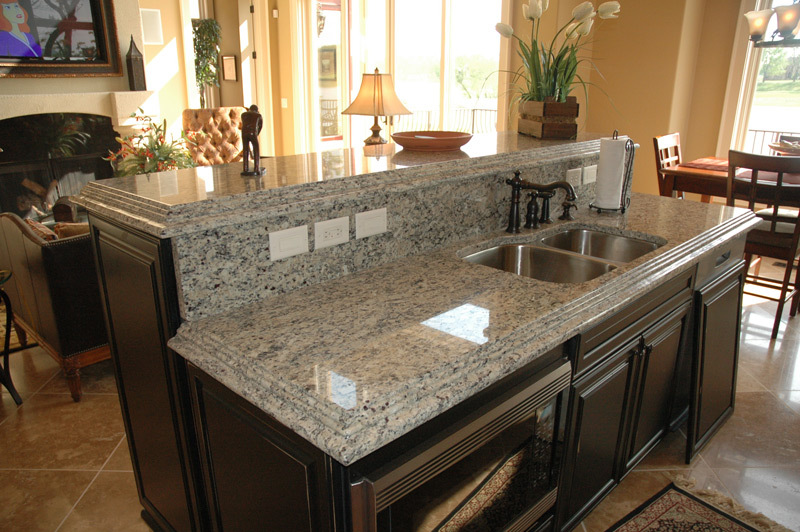 Due to its natural makeup, it is very difficult to scratch granite. 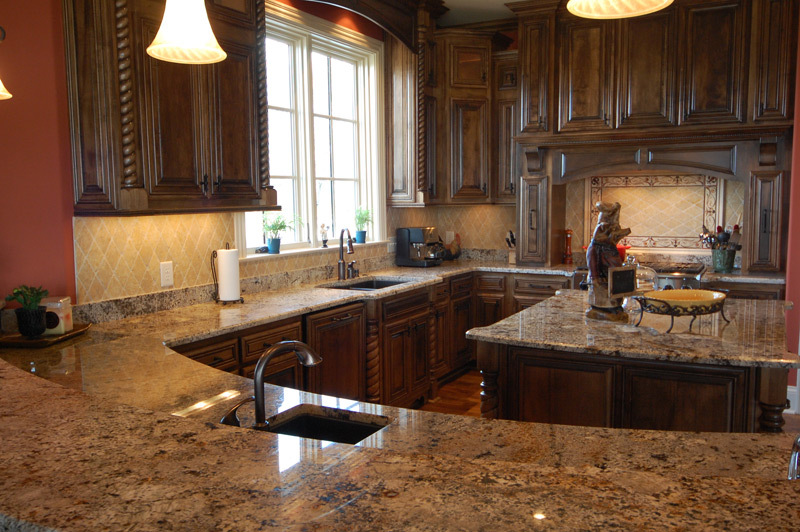 Granite is also resistant to heat, staining and chips. In the unlikely event that granite gets a scratch, stain or chip, it can be repaired by one of our stone experts. We offer sophisticated elegance and timeless beauty. Engineered with quartz crystals, this type of stone delivers distinctive depths, brilliant clarities, glimmering radiances, and a solid feel unique to natural stone. These quartz crystals are extremely hard minerals that resist scratches. Quartz is carefree, never needing sealing, polishing or reconditioning. 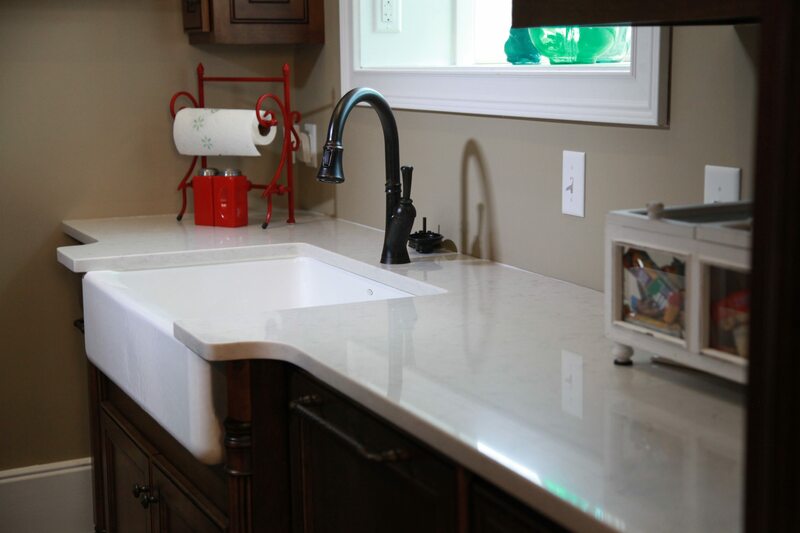 Quartz is also nonporous and easy to clean, so it doesn’t support the growth of mold, mildew, and bacteria. 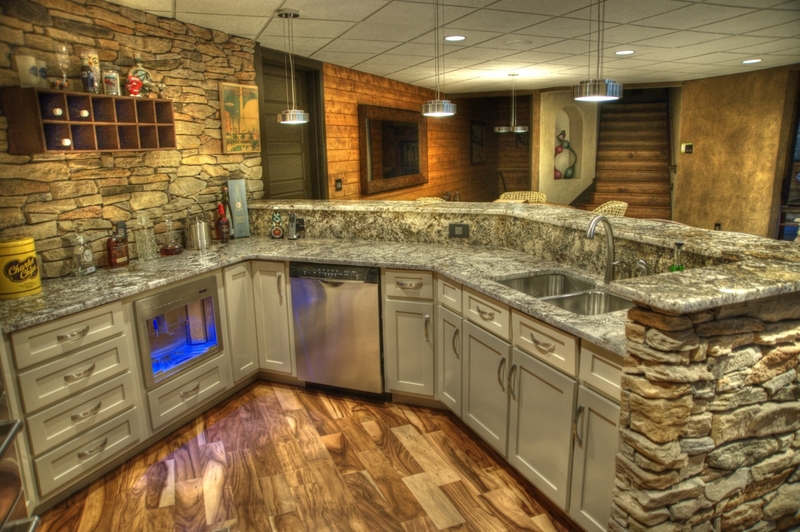 Engineered stones can be used virtually in any indoor surfacing applications, in countertops, island tops, bathroom vanities, tub and shower surrounds, fireplace surrounds, backsplashes, wet bars and much more. Known for being elegant and versatile, marble is formed from a crystallized limestone after experiencing intense heat and pressure, causing it to develop into a crystalline structure. After this process, minerals are created, which really bring out the depth in color and beautiful veining. 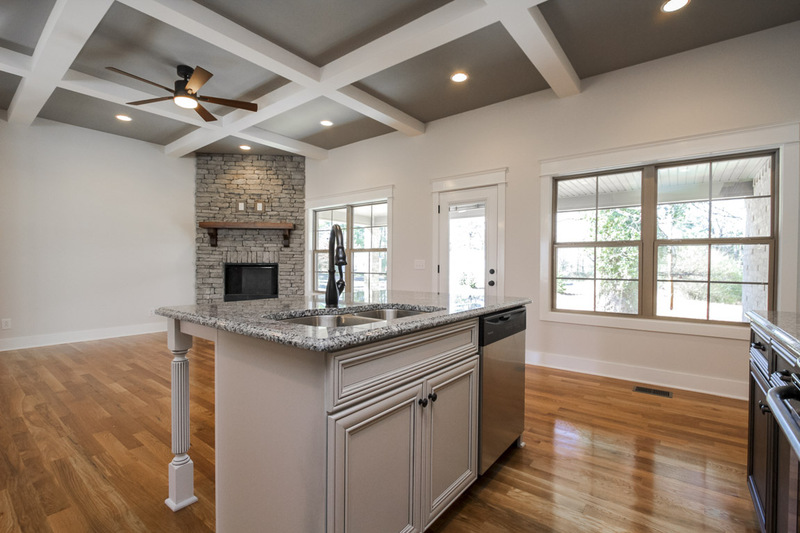 Over the years the marble will absorb stains, the polish will change, and the stone will begin to reflect the essential character of your home. Therefore, marble is traditionally left to age naturally letting friends and family rub “life” into the stone–stains and all. It’s hard to resist the classic beauty and the feelings of warm richness that marble conveys to any room. 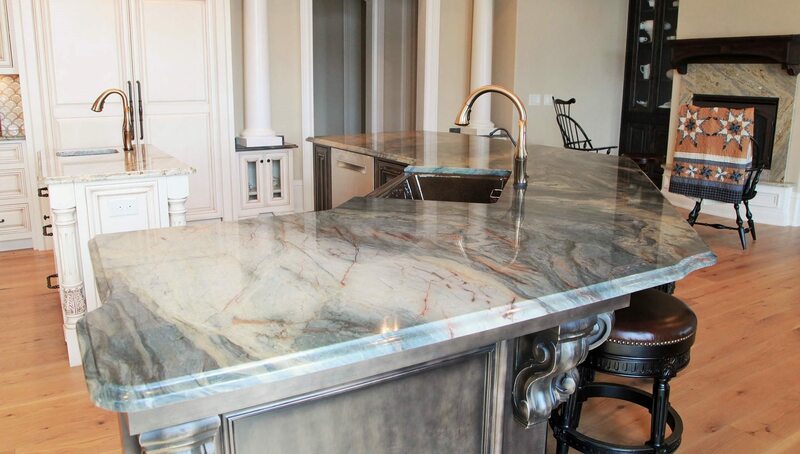 Countertops in marble will add immeasurable value and years of pleasure to your home. 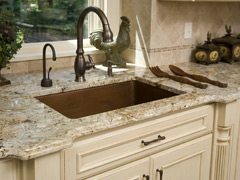 Is more popular with homeowners wanting a natural stone with a different look than the more commonly used granite and marble. 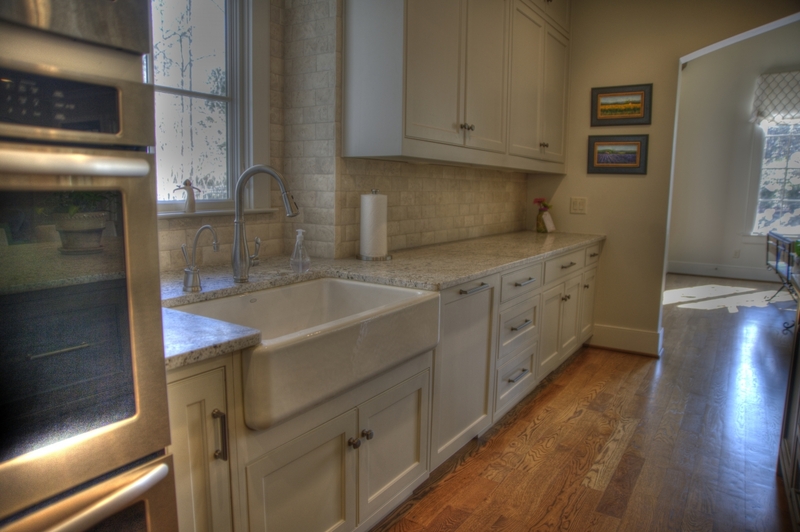 However, soapstone countertops have a limited color range, therefore, colors and qualities will vary somewhat. Spill anything on a soapstone countertop without worry; because it is nonporous and will not stain. 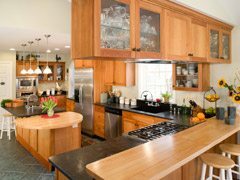 Although dense and resistant to staining, soapstone counter tops are softer than granite and marble; therefore, prone to nicks and scratches. Mineral oil is often routinely applied to a soapstone counter top to darken its color and keep it looking great. Onyx is a type of quartz that showcases a smooth, translucent appearance and a bright, deep luster. The most common colors of onyx include white, reddish brown, brown, green and black, and onyx is often used for countertops, backsplashes and tiles. Known for being luxurious and high-end, onyx has a softer consistency similar to limestone, so it has a tendency to scratch and stain easily if not properly maintained. 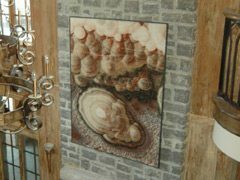 It is recommended that onyx be sealed on a regular basis for protection, but this process is simple, inexpensive and can be done oneself (similar to granite and limestone). Limestone is a soft, muted stone that is perfectly suited for today’s comfortable and casual lifestyles. Available in earthy colors of greens, beiges and tans, limestone can be polished or honed to fit perfectly in bathrooms, countertops, fireplaces and even flooring (in low-traffic areas).Limestones, which are sedimentary rocks, are formed at the bottom of lakes, seas and caves and are created over thousands (and even millions) of years. Over time, heat and chemical reactions cause the sediment to harden into a solid stone. There are many beautiful edging profiles to choose from, which will add dimension to your new stone top, amplifying its natural beauty. We offer both standard and upgraded edging profiles. Standard edging profiles are included in all written proposals at no additional charge. Upgraded edging profiles which add another level of beauty to your countertop range in additional costs per lineal foot, depending upon which edge profile is selected. 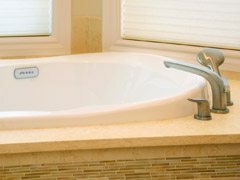 We offer a wide array of sinks in a variety of styles, materials, and colors to suit your needs. Click the links below to view sinks from our providers. 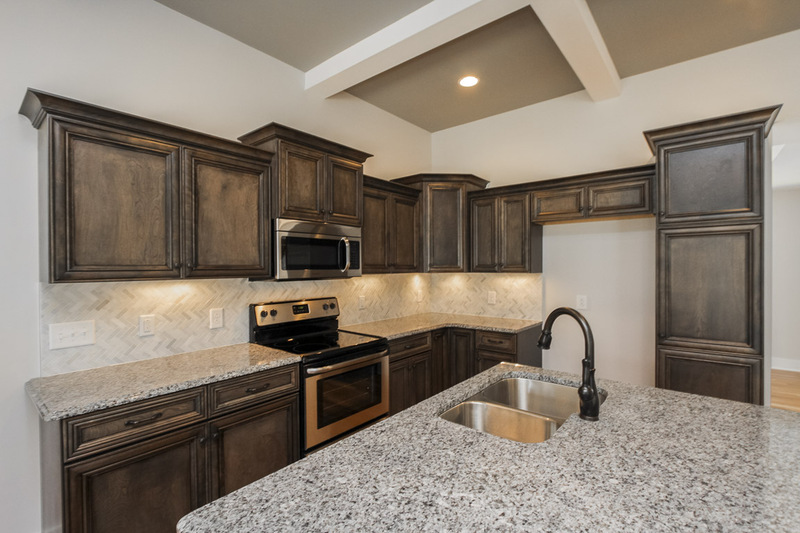 Click here to visit Tate Granite on Facebook!